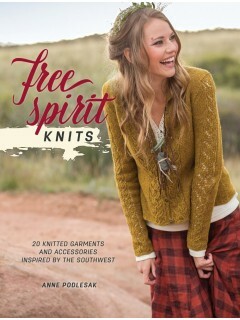 Today I am pleased to review a new book for you, Free Spirit Knits, by Anne Podlesak. I have had the honor of working with Anne over the years in a variety of capacities. We first met through Interweave's Jane Austen Knits magazine when I was working as an editorial assistant on the publication and she was a contributing knitwear designer. This past summer we were able to meet in person at TNNA, the knitting industry's national trade show, and on our return flights we shared the experience of being delayed in the Columbus Ohio Airport together. I couldn't have asked for a better person to be stranded with, she is intelligent, funny and extremely talented! This fall she was kind enough to invite me to be in her booth at the Salida Fiber Festival here in Colorado. Anne is an amazing photographer, writer, knitwear designer, indie yarn dyer and all-around fiberista. Her technical background in historical fashion design and her love for fiber and color shines through in all of her work. Free Spirit Knits, inspired by the dramatic landscapes of Anne's adopted home state of New Mexico, contains twenty stunning knitting patterns for men and women, and includes both accessories and garments. Anne's attention to detail and sophisticated color sensibilities shine through in this carefully curated collection of hand knits. 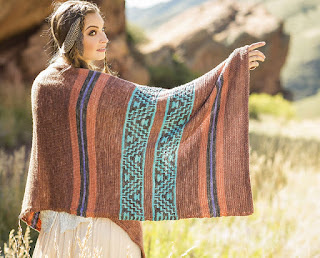 While remaining true to the southwestern inspiration for this beautiful book, Anne has cleverly created a series of deisgns that appeal to the thoughtful knitter everywhere, whether living in the country or the city, on the plains or in the high peaks. The Pottery Shard Jacket, shown above, is the perfect blend of classic design and dramatic detail. Having seen it in person, I can't neglect to mention how gorgeous Anne's independent hand-dyed yarn collection is. The Santa Fe Wrap features Anne's yarn, Wooly Wonka Fibers Nimue DK, in a stunning pallete of southerwestern inspired color. You can see all of Anne's yarns and fibers at her website, http://woolywonkafiber.com. 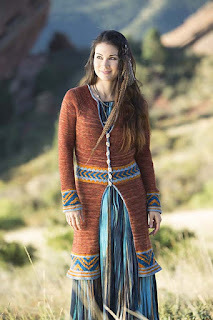 Anne Podlesak is an indie dyer who also knits, spins, and designs in the mountains of northern New Mexico. 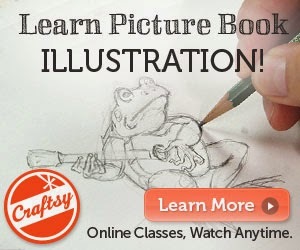 Her designs have been featured in Spin-Off magazine, Interweave special publications such as Jane Austen Knits, The Unofficial Harry Potter Knits, as well as her own independently released designs. Find her online at woolywonkafiber.com and on her Ravelry page: ravelry.com/designers/anne-podlesak.